Former Texas Gov. Rick Perry routinely boasts that border apprehensions dropped 74 percent in Texas after he sent state law enforcement to the border last year. But Perry takes too much credit. There was a sharp decline in apprehensions of individuals illegally crossing into the Rio Grande Valley, according to figures from the Texas Department of Public Safety. But there were multiple reasons for the decrease. News reports and migration experts say other factors, such as increased enforcement in Mexico and a federal advertising campaign deterring migration, were largely responsible. Perry has made the claim that border apprehensions declined 74 percent several times this year. It has become a standard line in speeches that address border security. He said it at the Conservative Political Action Conference on Feb. 27, and he brought it up at the South Carolina Freedom Summit on May 9. He recently talked about the decline at the Southern Republican Leadership Conference on May 21 (at the 10:00 mark). Perry, May 21: We have the right to secure our border. Last summer, I looked the president in the eye and I said, “Mr. President, if you will not secure the border, Texas will.” And that’s when I deployed the Texas National Guard to the border to take on the drug cartels, those transnational gangs, the ones that are shipping across the weapons, the drugs, the people. … We deployed our law enforcement. We deployed our parks and wildlife wardens, literally in the river. We deployed our National Guard as a force multiplier. And you knew what the result was going to be. I knew what the result was going to be. We had a 74 percent decrease in apprehensions in that region of the border because we were securing that border. Perry was referring to “Operation Strong Safety,” a state initiative started on June 23, 2014, by the Texas Department of Public Safety to combat criminal activity along the Texas-Mexico border. The operation also happened to follow a large increase in the number of apprehensions of people trying to enter the country, particularly through the Rio Grande Valley in Texas. That number peaked in June 2014, at nearly 38,500 apprehensions in that sector, as tens of thousands of unaccompanied minors and family units of parents and children from Central America crossed into the U.S. through Mexico. Authorized by Perry, Operation Strong Safety allowed DPS to send state law enforcement to the Rio Grande Valley sector to help local and federal authorities police the border. A DPS report released in March, detailing the cost and effectiveness of the state-led effort, declared that “OSS has stemmed the large influx of illegal alien traffic across the border.” According to DPS, border apprehensions declined from 6,606 in week 1 of the operation in late June, to less than 2,000 during week 11 in August. And weekly apprehensions remained near or below 2,000 through early 2015, the report said. Monthly statistics from U.S. Customs and Border Protection show a similar slide with total apprehensions in the RGV sector dropping 68 percent from June to September. That’s the most recent monthly data available online at the CBP website. A recent update of the Texas Border Security Dashboard, provided by DPS spokesman Tom Vinger, shows that there were 2,126 apprehensions in the Rio Grande Valley during the last week in April. And there were as few as 1,735 apprehensions two weeks prior to that. That’s how Perry comes up with a decrease of 74 percent. Be that as it may, no one, including Perry, can be certain how much of the drop in apprehensions was directly related to or caused by Operation Strong Safety. For one thing, the Texas National Guard, which Perry frequently mentions, didn’t have the authority to arrest anyone crossing the border. And apprehensions had fallen sharply by time the National Guard troops started arriving in the Rio Grande Valley in August. The federal government also increased the number of border patrol agents during that time. On June 24, Department of Homeland Security Secretary Jeh Johnson said he reassigned 115 additional border patrol agents from less active sectors to the Rio Grande Valley in May. And on June 30, he ordered about 150 additional agents to the region. DPS, citing security reasons, won’t say how many state, local and federal law enforcement officials, in total, were placed at the border as part of the operation. Furthermore, just as Perry credits Texas agencies for declining apprehensions in the area of operation, news reports and migration experts attribute the decline to other factors. “So what we can say is likely happening is that the United States is receiving fewer migrants while at the same time Mexican immigration authorities are detaining substantially more,” Chávez said, according to the Republic article. That was one of “3 Reasons Why the Massive Migration Spike of 2014 Has Faded,” according to a story published in March by the Washington Office of Latin America, a research and advocacy organization that promotes social and economic justice in the Americas. Another reason for the decline, according to WOLA, was a false claim spread by migrant smugglers that the U.S. was offering individuals residency permits that expired in June 2014. “This could help explain the sharp uptick in arrivals as part of a rush to arrive in the United States by that date, and would account in part for the notable decrease afterward,” it said. 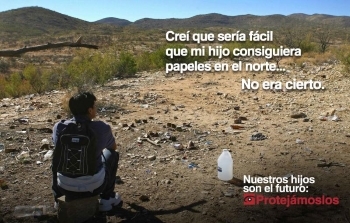 Also, U.S. Customs and Border Protection, on July 2, 2014, launched its advertising campaign to deter parents and children from migrating. The “Dangers Awareness Campaign” featured roadside billboards and public service ads for radio and television in Mexico, Honduras, El Salvador and Guatemala. The campaign stressed that individuals coming to the U.S. illegally would not be granted citizenship, be eligible for deferred action or given papers to remain in the country. So, what about the stepped-up state enforcement ordered by Perry?